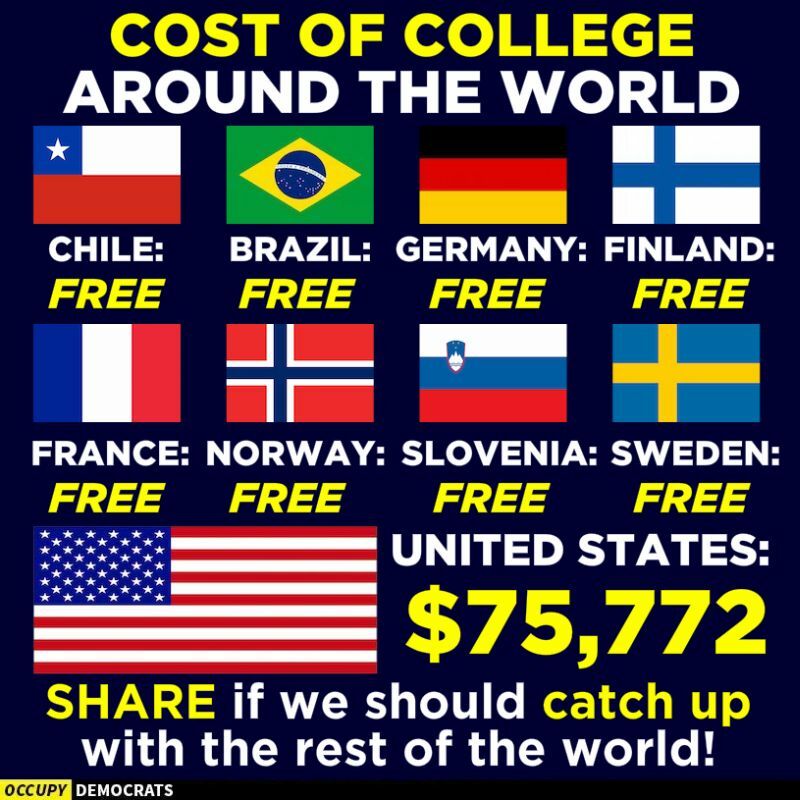 to support the claim that college isfree for deserving studentsin at least 8 countries around the world, including Chile, Brazil, Germany, Finland, France, Norway, Slovenia, and Sweden. While Democratic national contenders are calling for debt-free college in the US, they offer few details about how they would finance such a plan. Of course, many European countries like Germany already offer free college, though “free” is a relative term since tax payers absorb that cost. But those European countries often differ greatly from the US in substantive ways. Their college enrollment percentages, for example, are much lower than in America. European countries also differ substantively from the US in terms of the percentage of college attendees that their debt free models serve. For all countries, with the exception of Finland, the US has a much higher percentage of students who have enrolled in post-high school education. This will likely add a level of complexity to debt-free college plans in the US. The bottom line is that, outside the United States, university education is “free” only for those who get selected, the so-called “deserving” ones. But the criteria that separates the deserving from the undeserving is rationed by the state budget and other critical factors–to help bolster special state-selected industries, for example. The result is that college is “free” for only about 12-15%, and those numbers are usually reserved for the offspring of the political elites and the professional classes. The majority of America’s college-educated adults today could never have qualified to attend in the first place under such stringent rules. Freedom, opportunity, and economic sustainability will suffer if university education suddenly becomes “free” in the United States on the European model.